Sorry I've been away for so long, excuse any unanswered messages. It's been, erm, a hectic few months, moving state, divorce, all the usual fun. As I'm driving along and the engine dies, the tach goes down to zero. So, even if I'm in fourth gear going downhill at 40MPH, with just my foot on the accelerator and nothing else, the revs go to zero, even though the car is in gear and the wheels are still turning the crank. I've never seen a car in gear and moving with the clutch out and a tach read zero. I assume it's cable driven from the crank, so how is this even possible? The car will also die at idle and it will hit certain revs and die. 2.5K makes it die, but if I punch it and get past this point, it dies again at around 4K. Any ideas or guidance would be hugely appreciated. Anyone in the Bay Area who likes good beer and good company is welcome to pop over one sunny afternoon to see if there's anything obvious I'm missing! Edit: I already replaced the plugs and wires with the nice NGK blues and whatever the best plugs were. Last edited by St6fan on Fri Mar 23, 2012 2:31 am, edited 1 time in total. Sounds distributor related. Most likely a coil, maybe an igniter. The tach is not mechanical. If the coil goes bad(dies), no negative pulses for the tach. I've had two coil failures. 1 totally dead(luckily in the driveway), 1 wouldn't start after gassing up but after it cooled down I made it home. Another possibility is broken pickup coil wires. Vacuum advance can shift them and make or break the connection. Actually it could be this or the igniter as both will cause loss of neg pulses if they fail. The coil will too, but only if it goes open circuit. That leaves no voltage at the negative end of the coil. I agree, it sounds distributor related. My 85 had similar symptoms back around 1990. If I recall correctly, the dealer replaced the ignitor. It seems there was a recall on that part. Have had no distributor problems since. Somewhere in the ignition system for sure! I would try by the cheapest part cap and rotor! But first try testing the sparks by the coil and distributor if it sparks by the coil and not the dizzy you know the dizzy comes into play! Then if no spark by the coil, well it's whatever the igniter or coil itself! Make sure you got power coming in the coil too a test light can be made for! If no power is noticed check fusing! It has to be somewhere in around these cause of the tach failure it means it can't detect any negative pulse from the ignition! Dunno if a condenser is being use with ur system but could be that too if in use! Dont let your eyes to fool you!!! Coil/dist replacement it is. With the nicest possible parts I can find. Anyone want to point me towards a coil-replacement guide wins 117 Internet Points. Pointers towards parts suppliers are 35 points! 2-using a voltmeter, connect the + probe to coil + terminal and the - probe to ground(body) should be 12v. 3-connect the + probe to the - terminal of the coil and the - probe to ground(body) should be 12V! Good to see you back on the forum! Too bad about your problems, I still have your MR2 brakes for your Tercel! I tried to post this yesterday but site was not accessible for some reason. If the problem is with the ignition system the tach will die too, it is electronic, not cable driven (your are thinking of old British tachs, not Japanese). It takes the signal off the distributor. Likely an intermittent problem with the ignition system. If it starts and runs fine cold, and after everything heats up it dies, good indication it is marginal electrical components (work when cold and cut out when warmed up). Easiest to go to a wrecking yard and just buy a whole distributor assembly and swap it out. the dist assembly has igniter, coil and signal generator all in one, so a swap out is a simple test, and cheaper than buying the parts new. You might also change the fuel filter just to make sure, if the one you have is old. Get one for the same year corrolla, costs half as much, fits just fine but is twice as large. In the meantime, the car was running, but with the same issue when it died near my house. I tapped the distributor with a hammer a few times and now it's completely dead. What does this mean? Any idea as to whether this answers if it's the dist or the coil? Urgh! haha, i usually reserve the hammer treatment for a dying starter though i have been known to employ it for a few other jobs when particularly frustrated. the dizzy is easy enough to remove, disassemble, and inspect so you can figure out exactly what's wrong but like petros pointed out you should be able to find a good used one for cheap enough that you may as well just swap the whole thing. wreckers aren't going to sell you just the coil or igniter anyway. Got the whole kit and caboodle for $66 with a $5 core-return and a 13 month guarantee. Interesting, given Napa and others don't offer any warrantee on anything electrical. Any guidance as to the specifics of installing the replacement would be hugely appreciated. Also, how incredibly easy to remove is the piece? A single bold, some vacuum lines and a connector. Love that. remove the 3 screw/bolts that hold the dizzy cap on and remove the dizzy cap. take careful note of the position of the rotor (the little pointer guy underneath the cap) at this time. disconnect the 2 or 3 vacuum lines from the vacuum advance module and unplug the one electrical plug. remove the 12 mm bolt located at the front/bottom of the dizzy. now slowly pull the dizzy out of the head, noting how the rotor turns as you pull the dizzy out. probably a good idea to install a new dizzy o-ring on the shaft of the new dizzy while you have it out since they are a common source of oil leaks. slide the new dizzy in and make sure that the rotor is in the EXACT same position as when you first pulled the cap off. if it's not right, try again. once you're satisfied it's correct, leave the vacuum hoses disconnected and plug them, hook up the electrical plug, put the cap back on, and install the 12 mm bolt but only barely finger tight. get a timing light hooked up, start the car, and check the timing. rotate the dizzy clockwise to advance the timing and counter clockwise to retard it until the timing is at 5* BTDC according to the marks on the crank pulley and block. tighten the 12 mm bolt and re-check the timing to make sure it's still correct. now hook the vacuum hoses back up. drive the car and if all is well, disconnect the vacuum hoses, adjust the timing to 10* if you like, and hook the hoses back up. you could set it to 10* right away but i like to set stuff to stock specs the first time around just to rule out any possible hiccups. if you have mega trouble with getting the rotor in the right spot or forget where it was exactly you can remove the first spark plug, plug the hole with your finger, put a ratchet and socket on the crank pulley bolt, and crank it clockwise (make sure the transmission is in neutral for this step or you won't be able to turn the crank). when you feel pressure build up against your finger on the spark plug hole, that means the first cylinder is approaching top dead center. stop when the mark on the crank pulley reaches the '0' on the lower timing belt cover and/or shine a flashlight in the spark plug hole and get the cylinder up to the highest point it goes. be sure to remove the ratchet now so it doesn't destroy your radiator when you start the engine. now put the dizzy in with the rotor pointing to about 10:30--this is the first cylinder firing position. i've used this technique several times when i have lost track of the original rotor position and it's worked well for me. Last edited by dlb on Tue Apr 24, 2012 8:11 am, edited 4 times in total. St6fan wrote: Oh. My. God. I've never heard of pull-a-part in Oakland. Are you referring to pick and pull? If not please give me some more info. I hate when I can't find a part at pick and pull. 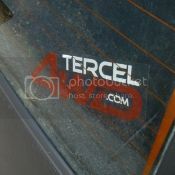 It's also cool to know that there is another tercel 4wd owner I. The east bay. I'm in San leandro. Maybe I'll see you around. Let us know how it turns out: I may be in same boat. I did a complete engine overhaul on my '83 and things where going great for the first 250 miles on the rebuild when it suddenly stuttered, and stalled as I was going about 35 mph. At first I thought my clutch gave out (which I replaced with new Toyota one) but then noticed engine died. It would restart, but it was not happy about it--would only run for a block or two then die again. I limped home and it died in the driveway when I was idling. I know I had some sediment in the tank and was running towards 1/8 tank so I and added more premium fuel and new fuel filter. Started right up and idled like a champ. Took it four blocks out, got comfortably into third gear, and guess what, stuttered and died on me. Limped home half a block at a time. I was thinking distributor--mine is a franken-distro built from three different ones. I have to move the housing all the way until it hits the stop to get factory spec timing. So post the results if you can! I would like to add one more thing. The mechanical advance on these distributors tends to go bad over time - I've had a few bad ones. With the vac advance disconnected and with your timing light hooked up, rev the engine and watching the timing mark gradually increase until it goes off the timing cover scale. I had one that would kind of act funny and would advance erratically, so watch out for this. I couldn't really tell too much while driving, but it was screwing up my gas mileage. I had another one that was stuck and wouldn't go below 10*, but would advance fine from that point forward, but it was still useless. The worst was one that I experienced had no advance whatsoever and that made the engine operate awful and it had no power.